It seems only appropriate that Siberia, well known for being a cold and remote land, isolated from humanity, should be connected to the Yamal Peninsula, a name that literally means the ‘end of the world,’ and more lately than ever before, standing on it makes you’re on shaky ground. One of the recent mysteries of Yamal in recent years is why it has such a porous surface. According to scientists working at the Russian Academy of Sciences (RAS), the reason is giant craters, and not directly related to the number of meteors that have stricken Russia in recent years. This summer, locals reported sighting a sinkhole 260 feet wide. A further analysis by Russian geologists now indicates that the region during the winter could suffer up to 30 more. Already, ten craters have been sighted throughout Yamal. Another crater, known as B2 is evidently surrounded with 20 smaller “baby craters,” all of which are filled with water, according to a report by the Siberian Times. He is the Deputy Director of the Oil and Gas Research Institute of Moscow. He suspects that the incidence of these craters coincide with the locations of Siberia’s Bovanenkovo gas field, according to The Siberian Times. Aside from meteors which were some significant YouTube sensations over the last few years, the cause remains something of a mystery. Some residents near Antipayuta of Siberia witnessed a flash near one of the craters. 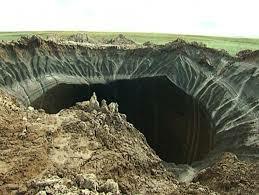 Some others living in Yamal reported tremors before the first of the sinkholes were sighted. Russian scientists have proposed one likely suspect: methane. There’s plenty of support for Bogoyavlensky’s claim too, as heightened levels of methane were reported in Siberia last summer. When the craters began to appear last July, scientists suspected that it may be among the most visible evidence we might have of the disastrous effects of global warming. Studies have attributed some of the more severe winters of the northern hemisphere to an increase in the loss of Arctic ice, in regions like Siberia, which have allowed cold jetstreams to move south. As temperatures rise, the permafrost begins thawing, releasing compounds like methane that then burst violently through the earth after centuries of buildup. As the ground warms over, it begins actively releasing more methane, while allowing for other tracts of land to thaw and eventually burst. Bogoyavlensky is of the suspicion that these gas emissions, similar to those caused by fracking, may have had a role to play in forming the craters, as could violent explosions. Warm weather that thaws the Russian tundra could cause natural gas reserves located underground to burst outward, bringing up rocks and debris with it, he said. Bogoyavlensky’s team had earlier observed some ‘degassing’ taking place in the Yamal lakes – in which natural gas rises from beneath a lake bed – evidence supporting Bogoyavlensky’s proposed theory. There’s another significant danger if methane is to blame. While levels of CO2 are the main reason for concern with man-made global warming, methane is capable of committing 20 times the amount of harm as CO2 over a 100-year span. Tom Wagner, a scientist at NASA, suspects that the sinkholes may be the result of the permafrost thawing and causing Siberian caves and underground tunnels to atrophy. Further investigation of the disaster areas is needed before either theory can be fully confirmed. Those who have observed the craters up close are reindeer herders indigenous to the region. Scientists have only viewed the giants from helicopters, after hearing the accounts of their sudden appearances. Although they hope to sample the craters and do more in-depth observation of the region, if Bogoyavlensky is correct, this sort of investigation could be dangerous, putting many geologists and other scientists in harm’s way, due to the land’s instability. If these are in fact gas emissions which are going unchecked, they could propose a significant threat to both drillers in the region as well as to people living in the local communities.